We’ve ditched basically everything that was popular in the ’60s -- bell bottoms, beehive hairdos, the Cold War -- but some things are so perfect that they become part of American culture forever. Such is the case for the McDonald’s® Big Mac®, a burger so ubiquitous that the name itself has become shorthand for American food worldwide (and having almost 37,000 McDonald's across the globe, in 119 countries, serving 69,000,000 customers daily certainly doesn't hurt). 2017 marks a new era in Big Mac history, with McDonald's offering two new sizes of its iconic sandwich. In its honor, we’re celebrating the biggest moments and milestones in the mighty sandwich’s storied history. 1967 - The first Big Mac (consisting of 2 beef patties, 3 buns, 1 slice of cheese, lettuce, onions, and a very secretive special sauce) is invented at a McDonald’s in Ross Township, a suburb of Pittsburgh. The inventor, Jim Delligatti, is the owner of several McDonald’s franchises, and he was seeking to compete with the Big Boy sandwich sold at local burger chain Eat’n Park. The burger debuts at a Uniontown McDonald’s, selling for 45 cents. 1968 - After becoming an instant local success, The Big Mac is introduced nationally, and the world of 3-bun sandwiches is never the same. 1971 - McDonald’s dreams up both “McDonaldland” and motley crew of characters who accompany the Ronald McDonald mascot: Captain Crook, Grimace, the Hamburgler, the Professor, Mayor McCheese, and “Officer Big Mac” -- a police chief with a Big Mac for a head. 1974 - McD’s introduces the Big Mac jingle: “Two all beef patties, special sauce, lettuce, cheese, pickles, onions, on a sesame-seed bun.” The ingredients' phrasing first appeared as a header for McDonald’s ads designed for college newspapers, then was adapted into a song by singer Mark Vieha -- who'd later contribute to the Teen Wolf soundtrack. The original commercials featuring the jingle only ran for a year and a half, but the phrase itself has been repurposed over the years for different Big Mac campaigns, and is probably playing in your head right now. 1983 - A Miami McDonald’s is the victim of a kidnapping -- of their 5-foot fiberglass statue of Officer Mac -- by a group calling itself NPLO, which stands for No Pickles Lettuce Onions. The ransom note was dropped off by an unidentified teenager, whose associates presumably snatched the statue after a late-night Mac Attack. The requested ransom? 40 billion Big Mac sandwiches and 40 billion-plus-one French fries. Needless to say, negotiations fell apart, and the statue is likely living with a man who is now in his early 50s but still talking about the great heist of '83. 1985 - McDonald’s officially recognizes Esther Rose as the originator of the name “Big Mac.” In 1967, Rose was a 21-year-old advertising secretary when she came up with the greatest sandwich moniker of all time (it’s pretty much the same in every language). The burger went by “The Aristocrat” and “The Blue Ribbon Burger” until Rose’s pitch became the final pick. McDonald's officially recognized her as the single originator of the name in 1985, commemorating the occasion to her with a personalized plaque complete with the likeness of the famous sandwich. 1986 - The Economist first publishes the “Big Mac Index,” using the Big Mac as a way to compare international currency value. It uses purchasing power parity to compare market exchange rates across different countries and currencies -- the important thing is that right now, for $50 USD, you can buy 33 Big Mac sandwiches in Egypt. Factor that into your next vacation plans as you see fit. 1999 - 12 McDonald's in the city of Derby, UK find themselves with a Big Mac shortage, swamped with ten times the usual demand while offering a two-for-one promotion. In true UK fashion, nobody rioted or anything, but a few customers were definitely miffed. 2006 - The “Bigger Big Mac” is released for a limited time in European cities, as part of the celebrations leading up to the World Cup. Despite being 40% larger than the regular Big Mac, it still probably wasn’t enough to assuage France fans. 2008 - In celebration of the Big Mac’s 40th anniversary, McDonald's asks people to submit their own versions of the famous jingle by asking users on Myspace (given the year, we can only assume that several screamo versions were submitted). The contest was won by 29-year-old music producer Jason Harper. In a redemptive turn of events, the 4th place finisher had previously done 12 years in jail for robbing a McDonald’s. 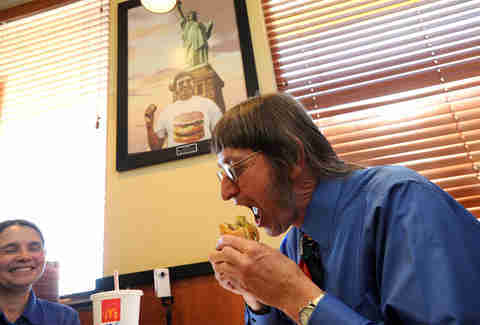 2011 - At the age of 59, Don Gorske, the current Guinness Book World Record Holder for most Big Mac sandwiches consumed in a lifetime, eats his 25,000th Big Mac. The retired prison guard crossed the 29,000 threshold in 2016. 2016 - The creator of the original Big Mac, Jim Delligatti, passes away at the inspiring age of 98. Delligatti is a true McDonald’s legend -- he’s also the originator of the hot cakes breakfast, not to mention he was the one who opened up the Big Mac museum. 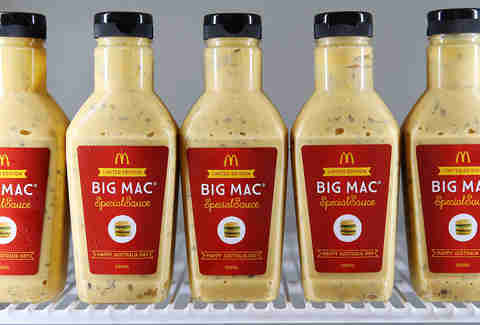 2016 - McDonald's creates the first Big Mac sauce variant, using a spicy Sriracha-flavored special sauce, and tests it at a handful of restaurants. 2017 - We truly are living in the future: Big Mac ATM’s are now a thing. 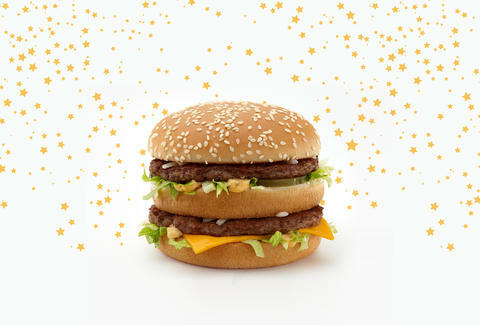 Plus, for a limited time, the Big Mac is now coming in new sizes -- the Grand Mac™ and the Mac Jr.™ Who needs jetpacks?